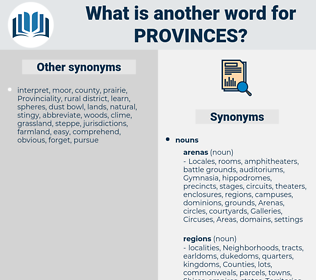 What is another word for provinces? prefectural, report, cheers, society, DHI, office, kivus, Reg, Managed, management, Les, manage, Them, CHST, Managing, U.S., healthy, -rsb-, PROV, bill, april, united, /, T, provincia. 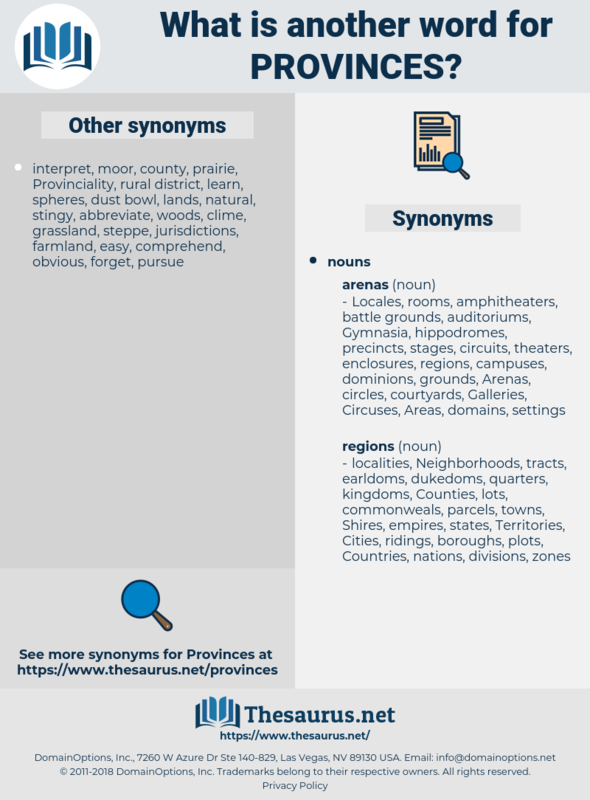 authorities, governances, Municipalities, conservatives, provinciales, interruptions, voivodeships, Areas, responsibilities, Cities, affairs, premiers, Constituencies, administrations, governors, agreements, producers, projects, expectations, people, providers, Resources, years, techniques, processes, kingdoms, locations, zones, inspection, inspections, villages, investigations, exemptions, enclaves, environment, perspectives, Communities, mainlanders, contributions, notices, PROSPECTS, Populations, parts, instances, afghanistan, Incomes, represents, protocol, cantons, Countries, premises, localities, maritimes, landscapes, terms, Expenditures, ministers, Organizations, divisions, woredas, Regencies, encourages, fields, Colonies, initiatives, Investments, disorders, finances, rule, ECUS, settlements, officials, services, communes, tibet, appears, census, places, revenues, Universities, outcomes, others, workers, ridings, courts, statistics, levels, expenses, reasons, velayats, programmes, offices, groups, Programs, sites, personnel, banners, telephone, successes, Adolescents, Persons, roads, teenagers, residents, seats, teens, exists, five, routes, thousands, monitor, road, laws, arrangements, partners, smokers, homes, acts, OGDS, thirds, ECU, Surveys, inquiry, Outbreaks, sharing, findings, highways, transfer, transfers, rates, boycotts, kids, statutes, regimes, members, Schools, Children, polls, dollars, cattle, crafts, Pupils, item, items, trends, Subsidies, Parties, exchanges, payments, Elles, results, Taxes, Standards, shares, schemes, B, cases, grounds, Ones, page, Students, plans, 19, women, Hospitals, Facilities, Adults, Grants, bucks, figure, fall, PP, six, data, F, Libraries, 1996, global, 1999, cheers. Well, I've come in from the provinces to attend your wedding. There are hundreds of places in the provinces where it is impossible for any man to lead the intellectual life without being condemned as an eccentric.